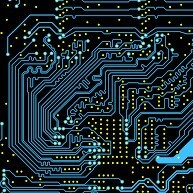 Practically speaking, printed-circuit boards (PCBs) are made from electrically linear material, that is, constant impedance. Then why can a PCB introduce nonlinearities into a signal? The answer is that the board layout is “spatially non-linear” with respect to where currents flow. An amplifier draws current from one or another supply depending on the instantaneous polarity of signal applied to the load. Current starts to flow at the supply and bypass capacitors and travels through the amplifier to the load. The current then returns from the load ground connection (or the board output connector shield) back through the ground plane to the bypass capacitor and then to the supply that originated the current. The popular notion that current follows the path of least resistance just isn’t true. Current follows the paths of all resistances in proportion to their conductance. In a ground plane there is often more than one low impedance path where a high proportion of ground current flows: one path that goes directly to the bypass capacitor, and another path that goes past the bypass capacitor and perturbs the input resistors before reaching the bypass capacitor. These two paths are illustrated in Figure 1. The ground return current is where the problem really occurs. When bypass capacitors are placed in different locations on the board, ground currents flow to their respective bypass capacitors by means of different paths. This is what “spatially non-linear” means. If a significant fraction of one polarity of ground current flows past the input resistor ground (thereby perturbing the voltage for only that polarity of the signal), while the other polarity of ground current does not, then the input signal voltage is modified in a non-linear fashion. When one polarity is modified and one is not, distortion occurs, and it shows up as second harmonic distortion in the output signal. Figure 2 shows this distortion in an exaggerated form. When only one polarity of a sine wave is perturbed, the resulting waveform is no longer a sine wave. So, how significant is this effect? Simulating an ideal amplifier with a 100 Ω load, with the load current coupling to the input ground voltage through 1 Ω on only one polarity of the signal gives the results shown in Figure 3. The Fourier transform shows that the distortion is almost entirely second harmonic at -68 dBc. This amount of coupling is fairly easy to produce at high frequencies on a PCB. It does not take much of a PCB’s special non-linearity effect to ruin an amp’s excellent distortion performance. When single op-amps display distortion induced by ground current paths, the ground current flow can be adjusted and kept away from the input components by rearranging the bypassing. This can be as simple as rotating a bypass capacitor to move its ground connection away from the inputs, which is illustrated in Figure 4. Multi-amplifier chips (duals, triples and quads) present a much more difficult problem, since it is not feasible to keep the ground connections of the bypass capacitors away from all of the input components. This is especially true for a quad amplifier. In a quad there are input components on all sides of the part, leaving no place to put the bypassing that mitigates the perturbation of the input channels. The easy approach to quad layout is shown in Figure 5. Most components connect straight to the pins of the quad amp. Ground currents from one of the supplies can perturb both the input ground voltage and the ground currents from the other channel’s supply, which results in distortion. For example, channel 1 in a quad amp can have the bypass capacitor for (+Vs) placed right next to its inputs, with the capacitor for (-Vs) being on the opposite side of the package. (+Vs) ground currents can perturb channel 1 whereas (–Vs) currents probably will not. To get around this problem, you can let the ground currents perturb the inputs while making the board’s current flow in a spatially linear fashion. To do this, you can put the bypass capacitors on the board such that both (+Vs) and (–Vs) ground currents flow through the same paths. If the input signal is perturbed equally by both the plus and minus currents, no distortion will result. To do this, put both bypass capacitors next to each other so that they share a common ground point. Since both polarities of ground current start at the same point (the output connector shield or load ground) and both are returning to the same point (the common ground connection of the bypass capacitors), both the plus and the minus currents will follow the same path. If one channel’s input resistor is perturbed by (+Vs) currents, it will be perturbed equally by (-Vs) currents. This is not distortion since the same perturbation happens regardless of polarity, with a tiny change in gain for the channel. This is illustrated in Figure 6. To test this idea two different board layouts were used: the Easy Layout (Figure 5) and the Low Distortion Layout (Figure 6). The distortion results are presented in Table 1 using the Fairchild Semiconductor FHP3450 quad operational amplifier, which typically has a 210 MHz bandwidth and 1100 V/µs slew rate, with 100 nA input bias current and 3.6 mA supply current per channel. As can be seen in the table, the distortion improvements are largest on the channels that were the worst (those with the worst load current coupling). The worst channels are improved the most, which makes all four channels much closer to identical in terms of performance. How Do You Know What Is Really Going On? In the absence of an ideal quad amplifier to put onto one’s board, it is pretty hard to measure the effect of a single amplifier channel on itself. Clearly, a given amplifier channel doesn’t just perturb its own inputs, but also perturbs other channels’ inputs. Ground currents flow past all of the different channel inputs, with differing results, but all are affected by each output. This effect is measurable. Table 2 shows what happens when just a single channel is driven with harmonics measured on the undriven channels. The undriven channels show a tiny signal at the fundamental frequency (board crosstalk), but they also show distortion products which, in the absence of any significant fundamental signal, are directly caused by the ground currents. The Low Distortion Layout of Figure 6 shows greatly improved second harmonic and Total Harmonic Distortion (THD) due to the near elimination of ground current effects. In simplified terms, on a PCB, the ground return current flows back to the different bypass capacitors (for each supply voltage) and to the supplies themselves in proportion to their conductance. High-frequency signal currents return to the small bypass capacitors. Lower frequency currents, such as in the audio range, might flow mostly to the larger bypass capacitors. Even lower frequency currents might flow directly to the supply wiring and ignore the bypass capacitors altogether. The specific application determines which current path is most critical. Fortunately, it is easy to protect against all ground current paths by using common ground points and ground bypass capacitors on the output side (if possible). Readers familiar with high-frequency amplifiers will be concerned about adding another constraint to board layout. The cardinal rule in high-frequency board layout is to place the high-frequency bypass capacitors as close to the package supply pins as possible. Modifying this rule to improve distortion is not much of a change, as can be seen by comparing Figure 5 and Figure 6. The distortion improvements come at a cost of adding about 0.15 inches of trace to the high-frequency bypass connections. For example, this had only a small effect on the AC response of the FHP3450 with performance being improved: the 0.1 dB gain flatness improved from 47 MHz to 55 MHz. Also improved was differential gain and phase, with differential gain improving from 0.1% to 0.08% and differential phase from 0.03 to 0.01 degrees (all AC coupled). Board layout is crucial in wringing all of the performance from a quality amplifier. The issues discussed here are not by any means limited to high- frequency amplifiers. Lower frequency signals, such as audio, generally have much tighter distortion requirements. The ground current effects might be reduced at lower frequencies, but if the required distortion performance improves correspondingly, ground currents can still be a significant issue.